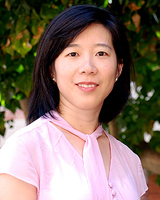 Margaret Shih is the Board of Visitors Term Chair Professor in Management and Organizations and Senior Associate Dean of FEMBA and Full Time MBA programs at the UCLA Anderson School of Management. Her research focuses on the effects of diversity in organizations. In particular, she focuses on social identity and the psychological effects of stereotypes, prejudice, discrimination and stigma in organizations. Prior to joining the faculty at the Anderson School of Management at UCLA, Professor Shih served on the faculty at the University of Michigan for 8 years, and also worked at the RAND Corporation. She serves on the executive committee for the International Society for Self and Identity and is a consulting editor for the Journal of Personality and Social Psychology and Personality and Social Psychology Bulletin. She was also an editor for the special issue of the Journal of Social Issues. She has received fellowships and grants from the National Science Foundation, National Institute of Mental Health, Social Sciences and Humanities of Research Council of Canada, John Templeton Foundation and the Robert Wood Johnson Foundation.